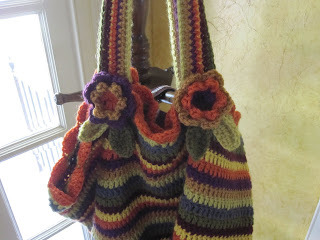 You can find the complete instructions for this bag at Lucy's blog Attic24 (my favorite new blog find). I actually like her colors better, but couldn't find them when I went shopping at Michaels. I will have to make another one with her vibrant color combination. I haven't had this much fun crocheting in a long time! 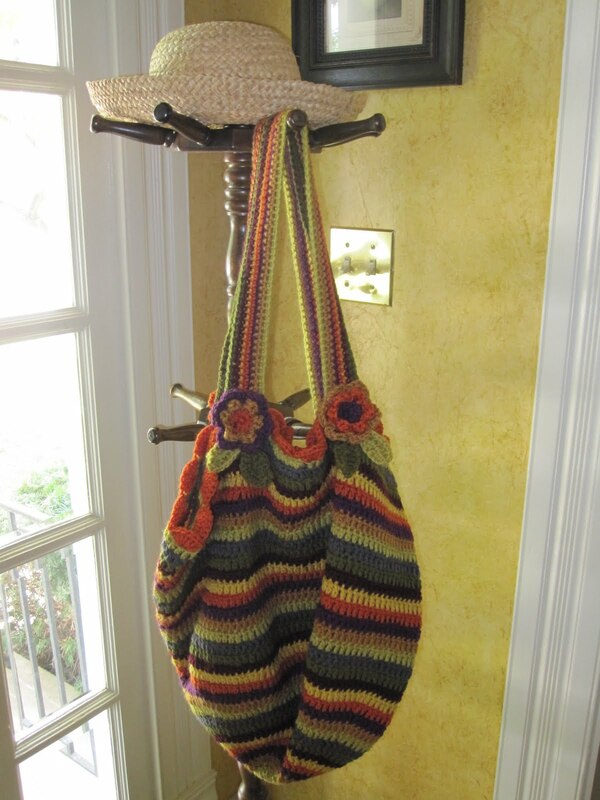 You'll not only like Lucy's crochet patterns, but also her cute way with words. I feel like I'm in the UK sitting there visiting with her over a cup of her tea while we chat about yarn. 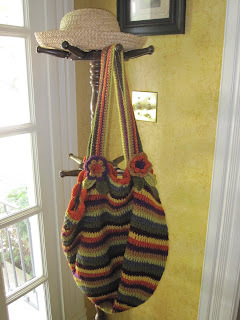 This bag is great for toting my yarn around. I think I'll make me a scarf with the remainder of these colors. vitivermI love it! I don't know how to crochet. And because I am left handed, I get confused when I try to learn, because it is all set for right handed people. What a fabulous bag!!!! I love it, so whimsical. Ooh I love this.. love the colors you chose too.. off to check out her blog.. thanks and have a great day! omg!!! !I love your bag! !Attic is so perfect! I love the earthy colors. perfect for fall. Maybe I'll try one but add a couple leaf embellishments on the top....thanks for sharing! I LOVE this bag,sis! And, I LOVE the colors you chose. Nice job! I love your crocheted bag, I think it's great! I am going over to visit Lucy. You know I love to crochet and new patterns are always fun to see and make. I like your colors too!. Did you line your bag?. I think I'm going to make me one. I'm making the rounds to let folks know Back Porch Musings suddenly vanished Tuesday between noon and 1. I don't know what happened! Long story. I started blog at Typepad and will improve it as it goes. I just needed an address for folks, as I go around the land of blog. Hope to see you at Typepad. Wow Catherine, what an awesome bag, you did a beautiful job...now you get to enjoy using it. Sweet bag! I love the colors you chose. I know you will enjoy using it! Thanks for the heads up on Lucy's blog.